The bishops’ statement A time to uphold the right to life was published yesterday and is available on www.catholicbishops.ie in text and video format. A video of the related media briefing by Archbishop Eamon Martin, Coadjutor Archbishop of Armagh and Bishop Brendan Leahy, Bishop of Limerick, is also available. Bishops ask the faithful to offer their prayerful support at home and in the parishes of Ireland for an important initiative being led by Pope Francis this weekend in Rome which celebrates the sanctity of human life. Evangelium vitae (The Gospel of Life) is an encyclical of Blessed Pope Paul John II, published on 25 March 1995, which expresses the teaching of the Catholic Church on the value and inviolability of human life. This weekend in the Vatican 15-16 June Pope Francis will celebrate the encyclical in a special event entitled, ‘Believing, May They Have Life’. This will be a key event for the Year of Faith which the Universal Church is celebrating during 2013. The chosen theme reflects the Church’s commitment to the promotion, respect, and dignity of human life. This Saturday 15 June at 8.30pm (Rome time) a silent, candle-lit procession will be held along Rome’s Via della Conciliazone in order to call attention to the theme of human life and its intangible value. It will be supported by pro-life people from around the world and the procession will conclude in Saint Peter’s Square. The following morning Pope Francis will preside at Sunday Mass at 10.30am with the entire ‘people of life’ to address his message and to show his care. Members of the Towards Healing Counselling & Support Service updated bishops on its 2012 annual report and the valuable work which the service has undertaken over the last year. The service was established in 1996 as the Faoiseamh Counselling Service and to date has provided 316,358 counselling sessions to 4,820 clients. The service is funded by individual dioceses and Religious Congregations to support survivors of physical, sexual and emotional abuse. During 2012 Towards Healing saw an increase in the demand for its services, which include: helpline support, face-to-face counselling, psycho-educational group work, self-help practical workshops, friendly call, restorative justice and advocacy. In 2012 this increase demand was most pronounced in the number of calls received by the helpline which amounted to almost 19,000 and in face-to-face counselling which provided over 29,000 sessions to 1,600 clients. The presentation was given by Mr James Nugent SC, Chairman; Mr Michael Lyons, Chief Executive; Dr Melissa Darmody, Clinical Director and Ms Breda Flood, Finance Manager. Bishops noted that the forthcoming G8 summit will be taking place in Enniskillen next week on 17- 18 June. Bishops discussed the values that inform our choices in matters of social and economic policy, and they underlined the need for the value of solidarity to be the guiding principle in decisions currently facing world leaders. Bishops agreed that, against the backdrop of the widespread suffering caused by poverty, inequality and social exclusion, solidarity is needed to rebuild trust, restore relationships and give hope for a real and lasting recovery. Bishops wished to add their voices to those calling for greater transparency in matters of finance and taxation and stated that the protection of the rights of the poorest and most vulnerable is not only a question of charity, but is primarily a question of justice. It is a responsibility arising from our duty to care for our neighbour. It is also an essential prerequisite for a truly prosperous society; without fairness and social cohesion we will never achieve lasting prosperity. Bishops said: It is a scandal that, despite all the extraordinary technological advances of the present age, one in eight people throughout the world are still going to bed hungry – including millions of children, who are not getting the start in life they deserve. As has been effectively highlighted in the ‘IF’ campaign, a more just and equitable distribution of resources is both achievable and imperative. In the context of the forthcoming G8 summit, Trócaire, the overseas development agency of the Irish Bishops’ Conference, has called for action to address structural injustices that have contributed to one billion people going hungry every day. With the current Millennium Development Goals (MDGs) set to expire in 2015, there is a need to strengthen efforts to tackle the underlying causes of poverty post-2015. Trócaire, along with other development agencies from Ireland and the UK, is calling on the G8 leaders to take the political decisions at their upcoming summit to ensure that everybody in the world has enough food. It is asking the leaders to address: tax transparency, trade reform, climate change, and the negative impact biofuels have on food production. Recognising that many people will be taking part in public manifestations on the margins of the G8 summit to highlight these and other social justice issues, bishops said it is vital that they are able to do so safely, peacefully and respectfully. Archbishop Diarmuid Martin, Archbishop of Dublin, Bishop Denis Brennan, Bishop of Ferns and Bishop Donal McKeown, Auxiliary Bishop of Down and Connor will join 165 pilgrims from Ireland who will travel in July to World Youth Day (WYD Rio2013) in Rio de Janerio, Brazil, the world’s largest Catholic country. Over two million people are expected to attend WYD Rio2013, the theme of which is: “Go and make disciples of all nations” (Mt 28:19). Irish pilgrims will represent the Archdiocese of Armagh, Archdiocese of Dublin, Diocese of Ferns, Diocese of Clogher, and the aid agency Trócaire. During WYD Rio2013 pilgrims will attend churches, halls, gymnasiums and auditoriums which have been reserved for catechesis. Over the week 273 liturgical events will be held in ten different regions in Rio de Janeiro and neighbouring dioceses. Pope Francis will undertake his first international pilgrimage as Pontiff for WYD Rio2013. The Holy Father will visit the poor and meet with young prisoners while in Rio de Janerio. Bishops recalled with thanksgiving the 50th International Eucharistic Congress in Dublin during June 2012 on the theme: “The Eucharist: Communion with Christ and with One Another”. Last year, in preparation for and advance of the International Eucharistic Congress, an International Theology Symposium was held in Saint Patrick’s College, Maynooth, entitled: “The Ecclesiology of Communion Fifty Years after the Opening of Vatican II”. Bishops expressed their gratitude to the faithful for their support – as well as commending the organisers – for the success and value of these occasions to the life of the Church in Ireland. Bishops reflected on the fruits of the International Eucharistic Congress in their dioceses and shared examples of follow-up events and congresses which have been held around the country over the past year. Bishops agreed that further evaluation of the legacy of the Congress, and developments since June 2012, should take place in the coming months. Bishops called on the international community to ensure the return of peace in Syria so as to avoid further bloodshed of innocent people and the increased destabilisation of the region. Bishops asked the faithful to pray for peace in Syria. On 24 April last media reports suggested that two Orthodox bishops had been kidnapped with one being Monsignor Gregorios Yohanna Ibrahim, Archbishop of Aleppo in the Syriac Orthodox Church since 4 March 1979. Monsignor Gregorios Yohanna Ibrahim studied as a postgraduate student at the Pontifical Irish College, Rome, in the 1970s. Bishops asked for prayers for the safe return of both men. The conflict in Syria has resulted in a humanitarian emergency both within the country and also in the camps and makeshift settlements in neighbouring countries. Trócaire is helping to provide support to Syrians who have fled to Lebanon, Jordan and Turkey to escape the conflict. Working with partners from the Caritas network of Catholic Church development agencies, Trócaire is helping to provide aid to over 21,000 people. Food, shelter, clothes and medicine have been provided. In addition to emergency items, Trócaire is helping to provide counselling and trauma recovery services. On the Turkish border, Caritas partners have established child friendly spaces to provide education and a safe environment for children who have been forced to flee their homes. The Council for Marriage and the Family will host a conference in Maynooth on 28 September next entitled: ‘Marriage at the heart of the Church’ which will explore the vision of marriage and family in Catholic theology and spirituality today. The aims of the conference are to introduce the Council for Marriage and Family to individuals and groups engaged in related ministries in the Church, and to invite this wider community of ministry into collaboration with the Council. The Bishops’ Conference welcomed its new members: Archbishop Eamon Martin, Coadjutor Archbishop of Armagh and Bishop Brendan Leahy, Bishop of Limerick, who were both ordained bishops since the Spring Meeting. Bishops also extended congratulations to Bishop-elect Raymond Browne, who will be ordained Bishop of Kerry on 21 July and to Bishop-elect Denis Nulty, who will be ordained Bishop of Kildare and Leighlin on 4 August next. 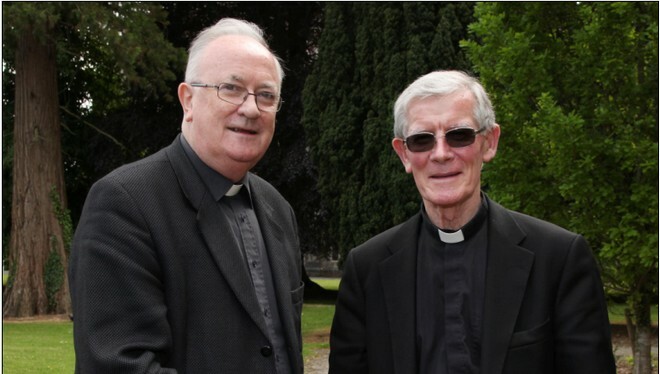 On the retirement of Bishop John Kirby, Bishop of Clonfert, as chairman of Trocáire, the Bishops’ Conference appointed Bishop William Crean, Bishop of Cloyne, as the new chair of Trócaire and as a member of the Trustees of Trócaire. Bishops expressed their gratitude to Bishop Kirby for his twenty years of service as chair of the overseas aid agency, and praised Bishop Kirby’s energy and dedication to promoting Catholic social teaching through work of Trócaire. Bishops paid tribute to Father Patrick Jones on his retirement, after twenty one years of service, as Executive Secretary of the Council for Liturgy and as Director of the National Centre for Liturgy in Maynooth. In particular bishops expressed their gratitude to Father Jones for his work regarding the introduction of the new edition of the Roman Missal. Bishops appointed Father Danny Murphy, Diocese of Cloyne, as the new Executive Secretary of the Council for Liturgy and as Director of the National Centre for Liturgy. Bishops appointed Reverend Dr Thomas Norris, Diocese of Ossory, as the new Spiritual Director in the Pontifical Irish College in Rome. Father Norris was formerly the Associate Professor of Systematic Theology in Saint Patrick’s College, Maynooth.